Artefact is published by the Irish Association of Art Historians. We aim to provide an outlet for publication for new and emerging scholarship in Ireland, by Irish scholars living abroad or on topics relating to Irish visual and material culture. We welcome submissions on all periods and aspects of art and architectural history, design history and material and visual culture studies. Articles should be between 3,000 – 5,000 words long. 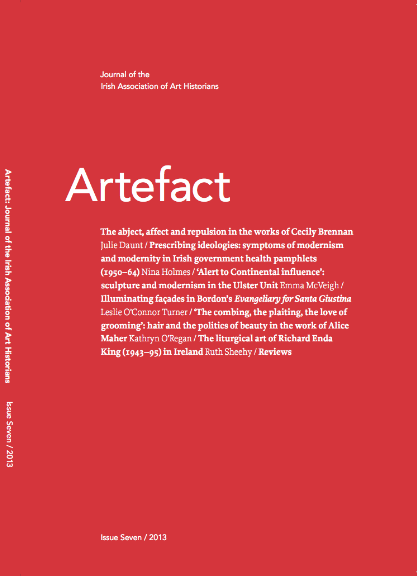 Artefact is a peer reviewed journal published by the Irish Association of Art Historians in consultation with academics from universities across Ireland, north and south. The journal aims to demonstrate the range and diversity of new and emerging graduate and postgraduate research undertaken in Ireland, by Irish scholars living abroad or on topics related to Irish visual and material culture. It is the only peer-reviewed journal in Ireland committed to publishing contemporary research in the areas of art history, design history, material culture and visual culture studies on Irish and internationally focused subjects. We welcome submissions on topics related to Irish art history, design history, material and visual culture studies. We will also consider more internationally-focused subjects from Irish-based scholars. For more information please email Artefact [artefactjournal@gmail.com].